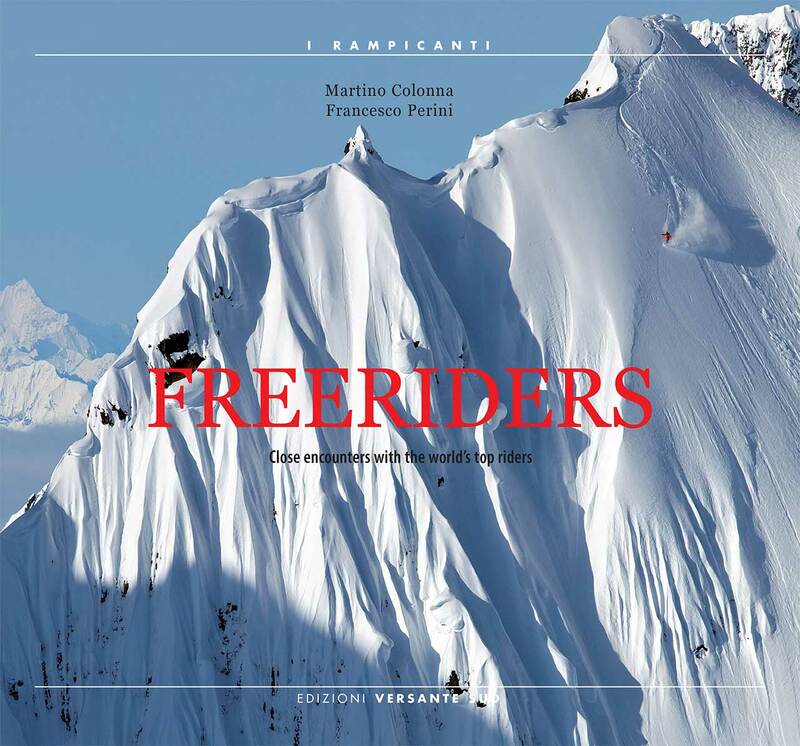 I’m glad and proud to have been featured in the new book ( Versante Sud ) of Martino Colonna and Franz Perini dedicated to Freeriding and Big Mountain skiing. Freeriding is not only a sporting discipline but also a mental one. It is the mind which pushes a rider to challenge his own limits and face up to an extreme descent, or set off to explore an unknown region. It is this interior aspect which comes out most in Freeriders. Eighteen interviews with skiers and snowboarders, both present and past, who have left their indelible mark on the world of freeriding and powder. Through their words and stories the profound reasons emerge which pushed them to face up to challenges and sometimes even risk their lives to feel free and leave tracks on their dream slopes. For many of them choosing freeriding was not the easiest option. They abandoned a much easier and less dangerous path, in order to express themselves in a way which represented them most, that is, with freedom and being in contact with nature. The lines they have tracked are partly the signature of their soul and their way of being. For this reason, at the end of the interview, each of them has described a line which best describes themselves, a line which to all intents and purposes is a symbol, a signature which has marked the evolution of freeriding. Xavier de Le Rue : The strongest snowboarders in the world, Full Stop! There are definitely some Characters here !! Here are 4 of the 14 Pages dedicated to my Profile. This entry was posted in News. Tagged Ane Enderud, Anne Flore Mrxer, big mountain riding, big mountain snowboarding, Bruno Compagnet, camp, Chris Davemport, Emilio Previtali, epic, extreme, fitwell, Franz Perini, freeride, Freeriders, Giulia Monego, Glen Plake, hors piste, John Falkiner, jonessnowboards, Karina Hollekim, luca pandolfi, Marco Galliano, Markus Eder, Martino Colonna, montagna, montagne, mountain, mystycfreeride, neige, neve, northwave, Paolo Tassi, pente raide, polvo, poudreuse, powder, ripido, salewa, snow, snowboard, snowboarding, steep, steep skiing, Stefano De Benedetti, Stian Hagen, Taro Tamai, Tone Valeruz, uomini, uomini e neve, versante sud, vertical attitude, Xavier de le Rue.